Maintaining and repairing valves, pumps, hydraulics, pneumatics... Your maintenance team does it all, and we'll be there with them every step of the way with the best, no-nonsense eLearning on the planet. This solution combines the Convergence LMS with our industrial maintenance eLearning courses to help you speed up the onboarding process and improve efficiency. You need fundamental training on a range of facility systems. We've got you covered. 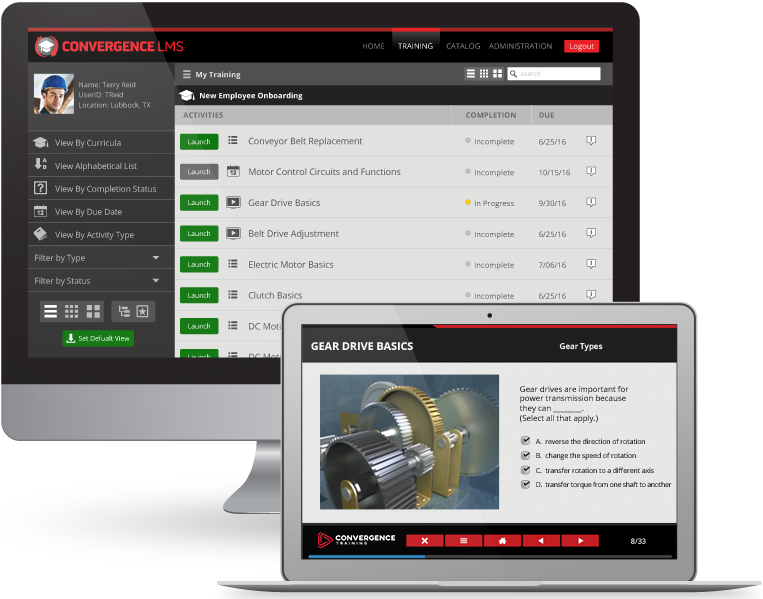 Pair our Industrial Maintenance courses with Convergence LMS to get your new hires up-to-speed quickly and elevate the knowledge and performance of your workforce. Deliver essential training to your maintenance with courses we developed using our unique style of graphics and animation. Put information in the hands of workers in the field when and where they need it. Reduce downtime with instant access to digital maintenance manuals and video-based SOPs. Learn how we can combine our software, courseware, and other technology to design a perfect solution for you.